Die-hard grill masters don’t let a little cold, ice or snow get in the way of a delicious meal. With these winter grilling tips, you can take charge of the weather and keep on firing up the grill all year long. You can’t grill properly if you’re uncomfortably cold. So be sure to bundle up in appropriate cold-weather clothing, but avoid wearing anything that might accidentally touch the grill while you’re using it. That means scarves, sleeves that are too long, fringed or fur trims, hoodie strings, etc. And remember – use barbecue gloves. Your snow gloves do not offer the heat resistance you need. Wind and grills don’t mix. Consider moving your grill to an outside spot that is protected from wind. This may be a different side of your yard, or closer to the outside of your house. The grill should be at least five to ten feet away from the side of your home or any combustible materials. Do not place your grill anywhere there is an overhang or a roof, such as a porch or an open garage, and never use the grill in an area that is enclosed. Safety is always a priority. Clear the pathway from your house to the grill. You don’t want to fall in the snow, slip on ice, or worse – drop that perfectly grilled piece of meat. And of course, brush and scrape the grill so that it is free of snow and ice. Make sure that nothing is blocking gas lines, burners and jets. Cold weather can cause you to use more propane and gas than you would during the warmer months. It can take longer for your grill to reach the right temperature and increase cooking time. Have an extra supply of fuel on hand to ensure that you can maintain the proper heat level. Minimize your time walking back and forth in the cold by planning ahead and bringing all your supplies to the grill at once. Meat, vegetables, brushes, tongs, sauces, trays, etc. Your recipes will need to take into account that it will take longer for food to cook in the cold. Crown Verity suggests adding 20 minutes of cooking time per pound for every 5 degrees below 45 degrees F.
To minimize your time standing in the cold, choose recipes that require shorter cooking times. Try grilling vegetables or small and thin pieces of meat. To preserve heat, open the lid as few times as possible. The more heat you lose, the longer it will take your food to cook. Use a timer and resist the urge to keep lifting the lid. Remove fat and build-up while the grill is still warm. It will be more difficult to clean food residue after it freezes. Get grilling this winter! 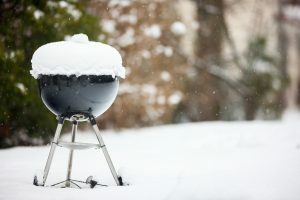 Check out this Omni blog post for additional grilling tips and MarthaStewart.com for some mouthwatering winter grilling recipes.